I love pastrami, corned beef and smoked meat. I’ve tracked them down in New York and Montreal to savor at every deli. I’ve made corned beef and pastrami based on Michael Ruhlman’s recipes in Charcuterie and enjoyed them thoroughly but continue to be troubled by the cost of raw ingredients. Brisket was used because it’s a very tough cut and nobody wanted it so it was cheap; cured, cooked and steamed it became tender when sliced thin. Unfortunately I can’t find it for less than $6 a pound which puts it past chuck and round. 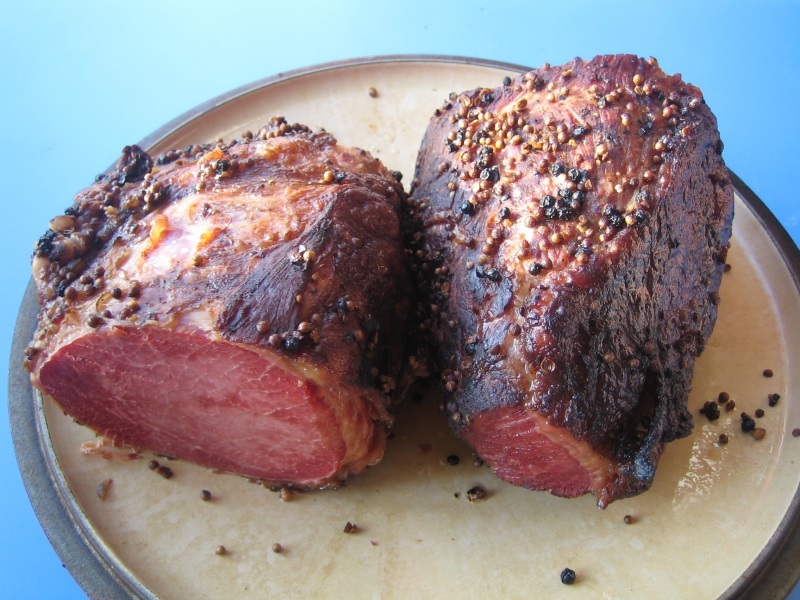 I made corned beef last year with outside round and it turned out a bit dry: not enough fat to keep it moist. I’d love to use short ribs but they’re almost the same price as rib eye. Eye of round in Southern Ontario goes on sale for $2 a pound fairly regularly so I always have a few whole pieces in the freezer: I always buy the biggest cuts I can so the decision of what size and how to use it can be made by me at home when I’m breaking it down. Anyway this cut has a nice layer of fat on the outside and isn’t too thick so it seemed the perfect vehicle for my smoked meat appetite. I wanted a simple recipe to see if the meat could shine so I surfed around and came up with this. It turned out really well; simplicity that pushed the pastrami flavour home. I would have preferred it a little fattier as it seemed slightly dry; that may have been from leaving it in the dry cure for two weeks instead of the week I was shooting for. Mix the dry rub and apply it to the meat. Put the meat in a container (I used a gallon Zip Lock bag) and put it in the refrigerator for seven to ten days, turning it over every other day until the meat is firm. Take the meat out and give it a good rinse in cold water to remove any of the cure. Put the meat on a rack uncovered in the refrigerator for a day to let it dry out a bit; this will aid it during the smoking process. Roll the meat in the pre-smoke rub, then smoke the meat at 200F until it reaches an internal temperature of 150F. Put it in the refrigerator for another day, then steam it until it reaches an internal temperature of 165F. I put it in a pot with an inch of water and put the meat on a metal steamer insert; on the stove at medium low so there was steam but not vigorous boiling. Remove, slice thin and groan every so slightly as you relish every bite. so it’s just the salt and sugar doing the curing?